Want to know a secret? I make tacos a lot. Like way more than you need to know about. As in probably (definitely) way too much. But they are, without a doubt, my number one go-to meal of choice. I can make them in my sleep (well, probably. I’ve never actually tested this theory) because they’re ridiculously easy. And they’re arguably one of the best foods in the world. And you know what? I’ve never posted my typical taco recipe on this blog. Because though amazingly tasty, the recipe is really not that exciting. I make them exactly the same way my mom made them when I was growing up because why change a good thing? Sometimes simple is the best. But I also included my true love kale instead of shredded lettuce. And I roasted up some corn to use as a topping. This ups the health factor AND the taste factor. 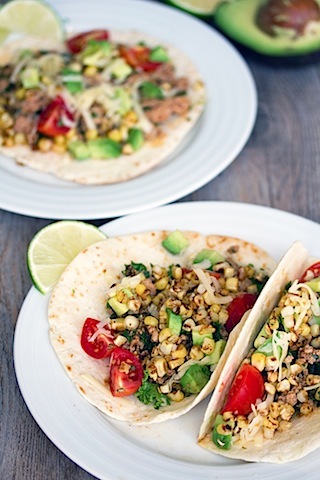 And might even mean I can squeeze yet one more taco night into my meal planning schedule. I’m not even sure if that’s possible, but I’m willing to try. 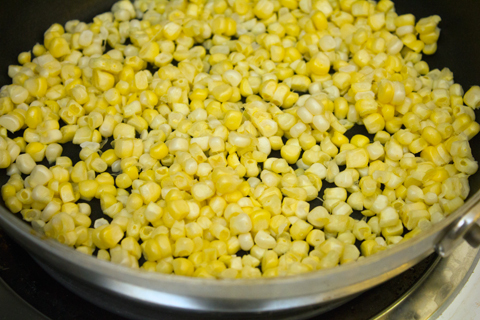 Start by putting your corn in a medium non-stick frying pan (don’t use any butter or oil) over medium heat. Let it sit for a few minutes until it starts really cooking and getting a big charred. Then, give it a stir and let it sit again. You’ll want to do this a couple time until the corn is browned to your liking. While corn is roasting, place turkey in a large saucepan over medium heat. Break up with spatula and cook until no longer pink. 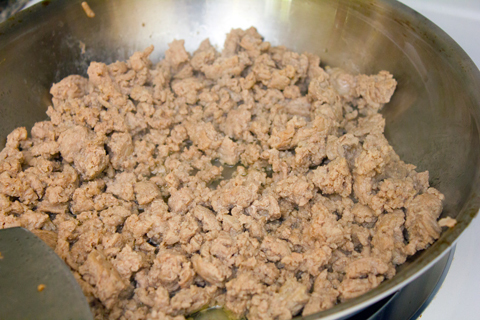 Once turkey is browned, add chili pepper, cumin, garlic powder, and oregano, along with 1/2 cup of water. Stir well, continuing to cook. Add in your chopped kale and jalapeños and mix together. 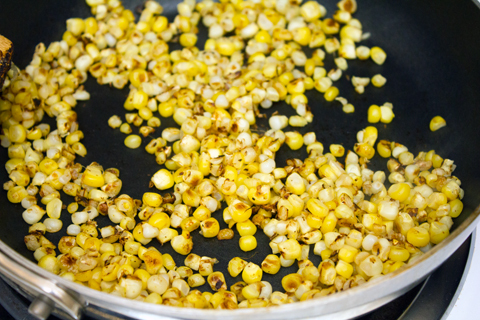 Once corn is done cooking, remove to separate bowl and spray the non-stick frying pan with a little bit of cooking spray. 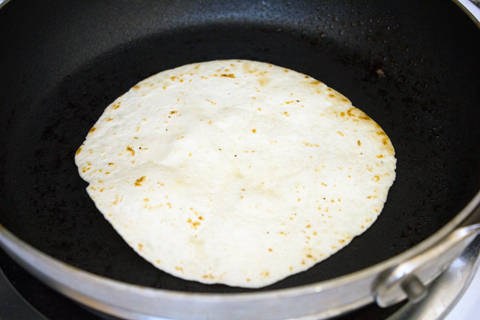 Place each tortilla in the frying pan and cook for about a minute on each side, so tortillas soften. 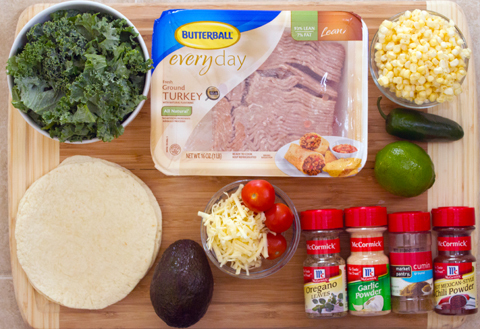 Now you’re ready to assemble your tacos! 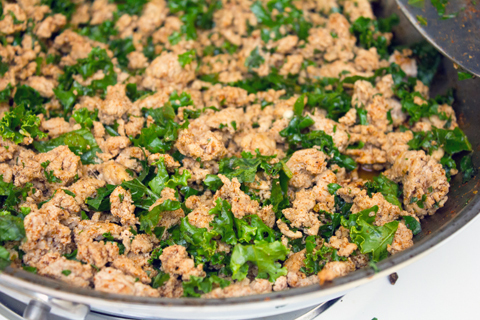 Start by topping tortilla with ground turkey and kale mixture. 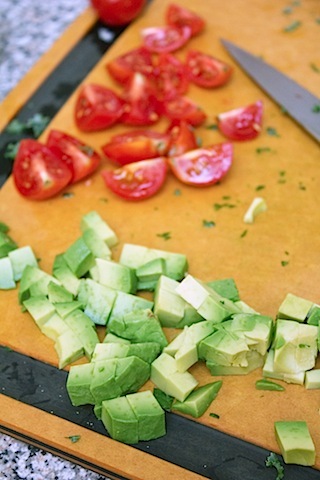 Sprinkle with cheese and then layer with chopped tomatoes, avocado, and roasted corn. It’s OK if you fill it up a little bit too much. The messier the taco, the better it is. I’m obsessed with these for many reasons. a) they’re different from my typical taco (and lord knows I need to switch it up! ), b) I can feel good about eating them since they involve lean ground turkey, fresh corn, kale, and other veggies, and c) the flavor. OMG the flavors. 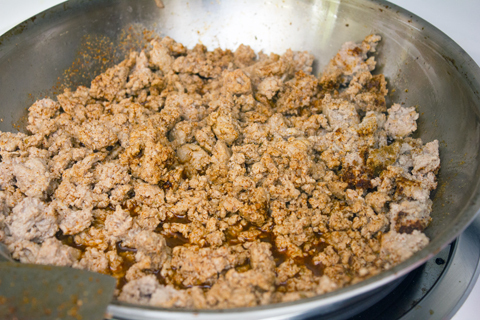 Start with the ground turkey, which despite being lean is already majorly flavorful. 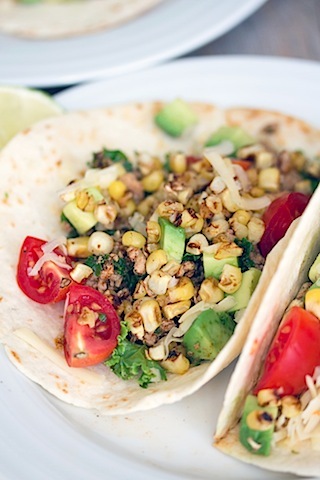 Add in the spices, the jalapeño, and all of the fresh produce and you will have no idea that these tacos won’t mess up your entire healthy eating plan. Perhaps this is my way of attempting to make myself feel a little less guilty about my excessive taco dinner planning. While fresh corn on the cob is best, you can certainly make this meal all year long with frozen corn. And, of course, there are about a bazillion different variations you could do. The important thing is the Butterball Ground Turkey and the spices. OK, you should totally roast that corn, too. Whatever you do, I hope you have a taco night on your meal schedule. And I kind of hope you have it as much as I do. Stand proud. How often do you make tacos? 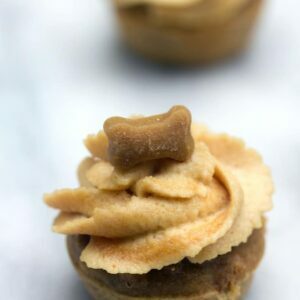 Do you make them with ground turkey? 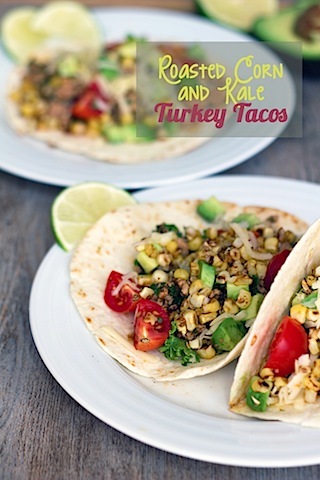 25 Responses to "Roasted Corn and Kale Butterball Turkey Tacos"
I am ALWAYS in the mood for tacos- these sound great! These are glorious! I always use turkey for my tacos too! That filling looks awesome! I make tacos pretty often and use turkey about half the time. I like it better, but Jeff prefers beef in his. I actually think the turkey stays more tender… which is a plus in addition to its being leaner. I eat tacos all the time. In fact, I’m eating one now. Gorgeous filling. 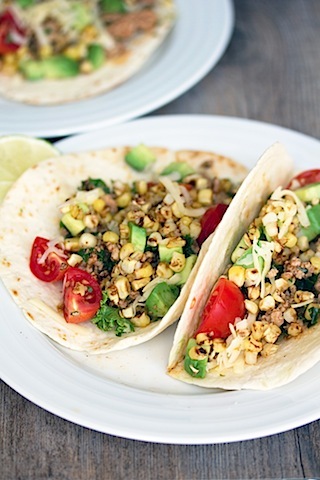 I have never made tacos at home and we don’t get ground turkey here – but they sound good! Girl, I am the biggest taco fan. I think this is a competition now! 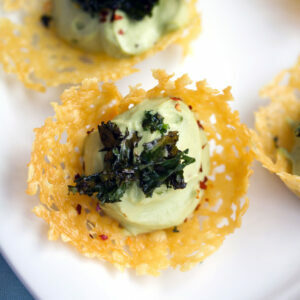 Loving how you used kale in your recipe, I will have to try that next time I make tacos at home. These look SO scrumptious! 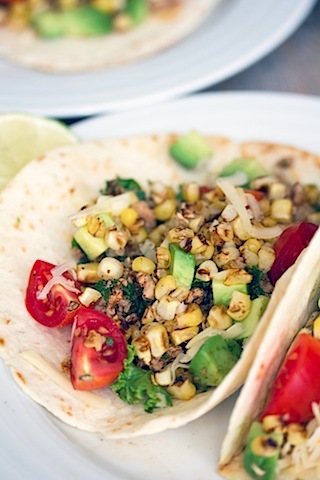 I love all that summery corn you added and I love how healthy these are. Definitely worth a try soon! I make tacos all the time, too. 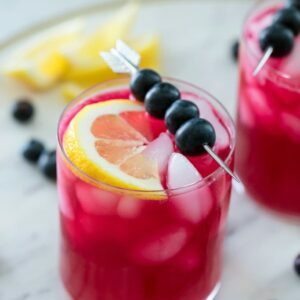 They’re so versatile, quick, and delicious! And I love how leftover tortillas freeze so well. My little one loves ground turkey (seriously!). I’ve never made tacos with it but I totally have to. Great idea. I can’t ever get enough tacos either. The more the merrier in my belly! Love how summery these feel! there’s no such thing as too many tacos in my book 🙂 these look delicious!! I can see why you eat these a lot…they look and sound delicious. I always make tacos for dinner. They are so easy and delicious. I’ll have to give this version a try. I had turkey tacos on the plan for next week! I’ll try your seasoning mix! YUM! 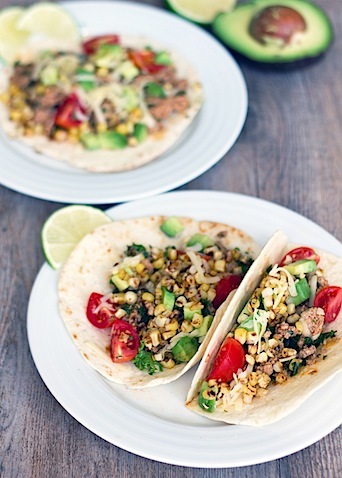 Delicious looking tacos, and so healthy…I love all the ingredients in it…yum! These tacos look great. 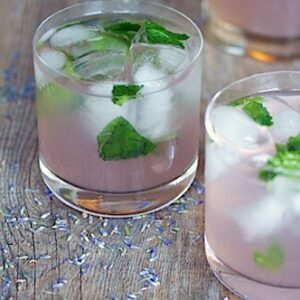 You’re right – sometimes the simplest recipes, the ones we’ve been using for ages, are the best! I make tacos a lot too! They are so good and easy. These look great! I love making tacos; the topping choices can be endless! 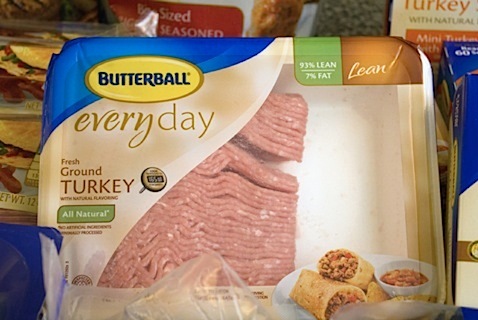 We eat a lot of ground turkey. We had turkey chili tonight! I confess that ever since I moved to Houston, where avocados and tasty tortillas are readily available, tacos have become a huge part of my life. I too use ground turkey, and when I first made the switch my husband didn’t even notice it wasn’t beef. I have a habit of frying up and seasoning more turkey than we need (1lb. Does two meals for us) so I just use it the next day in my version of quesadillas that I assemble cold and cook up on an electric grill. PS. I really want to say kudos on complying with the FTC guide on disclosing endorsements. I have enjoyed everything that I have made from your blog, and appreciate your clear disclosures. 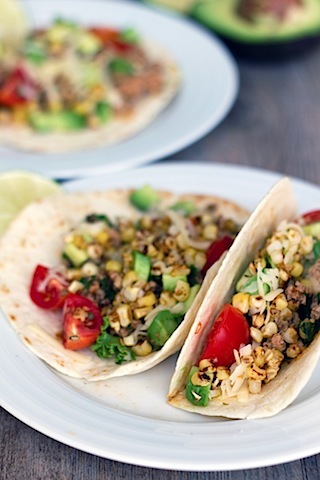 I love tacos too and they are so versatile! Flour or corn tortillas or lettuce. Different meats or fish and toppings. Best dinner ever!